Spanish personal pronouns have distinct forms according to whether they stand for the subject (nominative), direct object (accusative), or indirect object (dative), and third-person pronouns make a distinction for reflexivity as well. Several pronouns also have special forms used after prepositions. Spanish is a pro-drop language with respect to subject pronouns, and, like French and other languages with T-V distinction, modern Spanish makes a distinction in second person pronouns that has no equivalent in modern English. Object pronouns are generally proclitic, but enclitic object pronouns are mandatory in certain situations. In addition, the second-person singular pronoun vos is found in numerous regions of Latin America, spanning Central America, Uruguay, Paraguay, Argentina, Chile, Perú, Ecuador and Colombia and the Andean regions of Bolivia and the Venezuelan state of Zulia. Peninsular, Latin American, and Ladino Spanish personal pronouns are all listed in the table below. Sephardic Jews speak Ladino or Judaeo, which varies from other forms of Spanish as it uses archaic forms of personal pronouns. 1 Only in countries with voseo; in Judaeo-Spanish vos is the formal form instead of usted. Yo hago or just Hago = "I do"
Ellos vieron or just Vieron = "They saw"
English subject pronouns are generally not translated into Spanish when neither clarity nor emphasis is an issue. "I think" is generally translated as just Pienso unless the speaker is contrasting his or her views with those of someone else or placing emphasis on the fact that their views are their own and not somebody else’s. The masculine and feminine third-person pronouns (él, ella, ellos, and ellas) can refer to grammatically masculine and feminine objects, respectively, as well as people, although their explicit use as impersonal subjects is somewhat uncommon. The neuter third-person singular pronoun ello (as well as its plural ellos) is likewise rarely used as an explicit subject in everyday Spanish, although such usage is found in formal and literary language. Quite unusually among European languages, the first- and second-person plural subject pronouns (nosotros/nosotras and vosotros/vosotras, respectively) also inflect for gender: nosotros and vosotros are used to refer to groups of men (as well as men and women), and nosotras and vosotras are used exclusively to refer to groups of women. Like French and other languages with the T-V distinction, modern Spanish has a distinction in its second person pronouns that has no equivalent in modern English. The most basic is the difference between tú (vos in voseo areas) and usted: tú or vos is the "familiar" form, and usted, derived from the third-person form "your grace" (vuestra merced), is the "polite" form. The appropriate usage of these forms is fundamental to interpersonal communication. Using the usted form when addressing someone implies that the person addressed is a social superior, someone to whom respect is owed, or someone with whom one does not have a close relationship; in conservative families a child will use usted when addressing a parent. In contrast, the use of tú or vos implies that the person addressed is an equal, a comrade, a friend, someone with whom one has a close relationship, or a child or other social inferior, including (traditionally) a maid or other household employee. One can give offense by addressing someone with tú instead of usted, similar to inappropriately calling someone by his/her first name in English. Spanish has a verb, tutear, meaning to use the familiar form tú to address a person. Commonly, if a speaker feels that the relationship with the conversant has evolved—sometimes only after a few minutes of conversation—to a point where a shift from usted to tú is desirable, he or she will confirm this by asking if it is acceptable: Nos tuteamos, ¿verdad? or ¿Te puedo tutear? is fairly common. In Anglophone countries this would be parallel to asking if it is acceptable to call someone by their first name. In leftist political contexts, where everyone is to be equal, usted is rarely used. Conversely, in formal Spanish and hierarchical contexts (such as the Catholic church and the legal system), use of usted is routine. In the plural, in Spain (other than the Canary Islands and parts of western Andalusia), the usage of the familiar vosotros/vosotras and the polite ustedes is identical to the usage of tú/usted. In the Canary Islands as well as those parts of western Andalusia in addition to Spanish America, vosotros is not used except in very formal contexts such as oratory, and ustedes is the familiar as well as the polite plural. The distinction extends to other types of pronouns and modifiers: when using usted one must also use the third-person object pronouns and possessive adjectives. "Tu casa" (tú with an (acute) accent is the subject pronoun, tu with no accent is a possessive adjective) means "your house" in the familiar singular: the owner of the house is one person, and it is a person with whom one has the closer relationship the tú form implies. In contrast, su casa can mean "his/her house", but it can also mean "your house" in the polite singular: the owner of the house is someone with whom one has the more distant or formal relationship implied by the use of usted. Similarly, the use of usted requires third-person object pronouns. Te lavas means "you [familiar singular] wash yourself", but se lava can mean "you [polite singular] wash yourself", as well as "he/she/it washes himself/herself/itself"'. The Spanish impersonal pronoun is uno ("one", as well as una for women), which declines as a normal third-person pronoun and is treated as such for purposes of conjugation and reflexivity. It is used in a variety of situations, although many ideas that would be expressed with an impersonal pronoun in English would more often be expressed with passive constructions in Spanish, e.g. "That would not be done" as opposed to "You (One) wouldn't do that". The reflexive pronoun is used with pronominal verbs, also known as reflexive verbs. These verbs require the use of the reflexive pronoun, appropriate to the subject. Some transitive verbs can take on a reflexive meaning, such as lavar (to wash) and lavarse (to wash oneself). Other verbs have reflexive forms which do not take on a reflexive meaning, such as ir (to go) and irse (to go away). Some verbs only have reflexive forms, such as jactarse (to boast). Yo mismo lo hice = "I [masc.] myself did it"
No entiendo porque necesitas la cosa misma = "I don't understand why you need the thing itself"
Dáselo a los hombres mismos = "Give it to the men themselves"
Unlike English intensifiers, which are often placed several words after the noun they modify (e.g. "I did it myself"), Spanish intensifiers must come immediately after the noun they modify. Object pronouns are personal pronouns that take the function of an object in a sentence. In Spanish, they may be analyzed as clitics which cannot function independently, but take the conjugated form of the Spanish verb. Object pronouns are generally proclitic, i.e. they appear before the verb of which they are the object. Enclitic pronouns (i.e. pronouns attached to the end of the verb or similar word itself) most often appear with positive imperatives and may appear with infinitives and gerunds as well. In all compound infinitives that make use of the past participle, enclitics attach to the uninflected auxiliary verb and not the past participle(s) itself. Él me lo dio = "He gave it to me"
Ellos te lo dijeron = "They said it to you"
Yo te me daré = "I will give myself to you"
Vosotros os nos mostráis = "You [pl.] are showing yourselves to us"
A las tropas las dirige César. = "Caesar directs the troops." When an accusative third-person non-reflexive pronoun (lo, la, los, or las) is used with a dative pronoun that is understood to also be third-person non-reflexive (le or les), the dative pronoun is replaced by se. Simple non-emphatic clitic doubling is most often found with dative clitics, although it is occasionally found with accusative clitics as well. In a wide area in central Spain, including Madrid, there exists the practice of leísmo; which is, using the indirect object pronoun le for the object pronoun where Standard Spanish would use lo (masculine) or la (feminine) for the object pronoun. Mi coche es más grande que el tuyo = "My car is bigger than yours"
Tu casa tiene más cuartos que la suya = "Your house has more rooms than his/hers/yours/theirs"
Estos libros son más interesantes que los vuestros = "These books are more interesting than yours [pl.]" Esas camisas son más pequeñas que las nuestras = "Those shirts are smaller than ours"
Este coche es mío = "This car is mine"
Esta camisa es suya = "This shirt is his/hers/yours/theirs"
Estos pantalones son más largos que los de él = "These pants are longer than his"
Esta camisa es de ella = "This shirt is hers"
The neuter article lo can also be used with genitive pronouns to express the concept of "what is mine", "what is yours", "what is his", etc. : lo mío, lo tuyo, lo suyo, etc. Genitive pronouns are identical in form to long-form possessive adjectives, which can be placed after the noun to place emphasis on the fact of possession. In the past, the pronoun vos was used as a respectful form of address, semantically equivalent to modern usted. This pronoun used the same conjugations as modern vosotros (see below) and also the oblique form os and the possessive vuestro/-a/-os/-as. However, unlike vosotros, which always refers to more than one person, vos was usually singular in meaning. The modern voseo of several countries (see below) derives from this old form, but has become a generic form of address instead of a specifically respectful form. Vos and its related forms are still used in literature, cinema, etc. when trying to depict the language of past centuries. The pronoun "vos" is used in some areas of Latin America, particularly in Central America, Argentina, Uruguay, Paraguay, Chile, the state of Zulia in Venezuela, and the Andean regions of Colombia, Bolivia, Perú, and Ecuador. These are all distant from the large Spanish colonial cities, like Mexico City, Cartagena (Colombia), and Lima. In some areas, like the River Plate region, vos has become the only generic form of address for the second-person singular, that is, it has the same meaning that tú has elsewhere (informal and intimate). In other areas, like Chile, it persists as a fairly stigmatized form alongside the more prestigious tú. In some other areas, it is employed among equals but not for very close people (couples or family) or to inferiors (children, animals etc. ), where the pronoun tú would normally be used. Ladino speakers use vos as well, except that they employ it as in Old Spanish (see above), that is, as a respectful form of address, equivalent to how usted is used elsewhere. In fact, Ladino speakers do not use usted at all because vos implies the same respect that it once had in Old Spanish. In Ladino, tú is used towards anyone in an informal manner. The variant vusted/vustedes is mostly a regionalism in some South American countries. It is common to hear it in isolated areas of Colombia and Venezuela. Other speakers consider it archaic because it is an older form of a contraction of vuestra merced. In Colombia, it is not unusual to hear people use su merced interchangeably with usted. Su merced can be used in the vocative case as well, e.g. when speaking to an older person, as in Su merced, ¿por qué no vienen vusted y sus nietos a mi casa esta tarde? Vuestra merced (literally "your grace") is the origin of usted, usarcé and similar forms that govern third-person verb forms with a second-person function. They are mostly confined to period works now. It is unlikely that similar-sounding Arabic ustādh أُسْتَاذْ ("professor") was involved in the formation of Spanish usted, given the weakness of the semantic link and the fact that usted is not documented before 1598[a] — over a century after the fall of Moorish Granada. Today, the informal second-person plural pronoun vosotros is widely used by Spaniards, except in some southwestern regions and in most of the Canary Islands, where its use is rare. Among the former colonies of the Spanish Empire, the use of vosotros and its normal conjugations is also retained in the Philippines and Equatorial Guinea. Vosotros is the only form used by Sephardic Jews who speak Ladino. Más de un batallón de los vuestros, invasor rubio, habrá mordido el polvo de mis agrestes montañas. Vosotros is not unusual in oratory, legal documents, or other highly formal or archaic contexts. Forms based on vosotros and vos are used in many Spanish-based creole languages. In Chavacano, spoken in the Philippines, vo is used alongside tu as a singular second-person pronoun in Zamboangueño, Caviteño, and Ternateño. In Zamboangueño, evos is also used. For the plural, Zamboangueño has vosotros while Caviteño has vusos. Papiamento, spoken in Aruba, Bonaire, and Curaçao, maintains boso (singular) and bosonan (plural). Since it was used with slaves, the forms that seemed disrespectful in the rest of America were common. Menda is the equivalent of I in Caló, where it is concords in first person singular. In Spanish slang, el menda / la menda can be used as an emphatic I, concording with a third person verb, but its use is receding. ^ Pountain, Christopher J. (2001). 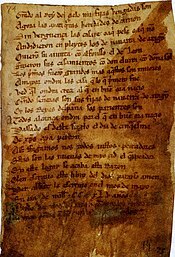 A History of the Spanish Language Through Texts. Routledge. pp. 177, 264–5. ISBN 978-0-415-18062-7. ^ "Pronombres Personales Átonos" [Unstressed Personal Pronouns]. Diccionario panhispánico de dudas [Pan-Hispanic Dictionary of Doubts] (in Spanish). Real Academia Española. Retrieved 9 April 2017. ^ In José Rizal's Noli me tangere, Salomé uses vosotros to refer to Elías and his passengers that day. In its sequel, El filibusterismo, in the chapter entitled Risas, llantos, Sandoval addresses his fellow students using vosotros. ^ Daniel Eisenberg, "What I Have Learned about Spanish from 22 Years of Teaching It", Journal of Hispanic Philology, 16, 1991, pp. 3-9, https://web.archive.org/web/20160313023530/http://users.ipfw.edu/jehle/deisenbe/JHPcolumn/WHATIVE.htm, retrieved May 4, 2017. ^ Reproduced in John G. Copland, Ralph Kite, and Lynn Sandstedt, Literatura y arte, 4th ed. [n.p. : Hold, Rinehart and Winston, 1989], p. 123. This page was last edited on 12 March 2019, at 18:53 (UTC).